It was Linus Minus day yesterday at the Arithmetic Village workshop. After we read the book, an enthusiastic child volunteered to act out Linus Minus and the others volunteered to keep track of the jewels he lost on the white board. That’s when Poppy started drawing. She drew so fast while I was preparing Linus, by the time I turned around, she had drawn this huge squiggly thing on the board. My instant impulse was to ask her to wipe it off, but I intuited that action would be greeted with great resistance. I remembered my goal for the day – “to ensure these children ENJOYED maths”. So, I let her be for the moment and continued with the rest of the group. Then I noticed, out of the corner of my eye, Poppy had confiscated the book and was drawing more ferociously. All the other children obediently tracked enthusiastic Linus’ actions on the board in the form of equations and we rolled along while Poppy drew. A few minutes later, I had the time to give Poppy’s work some attention. It didn’t look like much at first, just a stick figure, a path some numbers and some stick figures at the end. I asked her to tell us about it. “This is Linus. He starts with lots of jewels then he loses 5 then he loses 5 more then 1 then 3, then he loses 3 more, then he loses 2 and he has one left to give the king.”. You should have seen her smile. She was very proud of herself. I asked if I could take a picture of it and she insisted on signing it first. It wasn’t just a squiggle. Poppy had paraphrased parts of the book and parts of the play that was being acted out. She didn’t have all of the sums worked out and she didn’t follow everything perfectly, but she did get the concept. She showed the ability to map out “subtraction”! (And so what if her numbers are backwards!) Most importantly, she was fully engaged and having FUN! I was so grateful that I didn’t stop her processing, erase her work and try and cajole her with MY math process, not HERS. 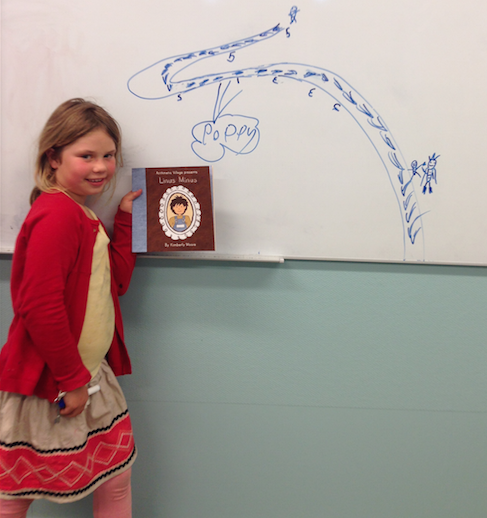 By letting Poppy be, she learned she is capable, a great story teller and a fabulous mathematician! The lesson of letting go and letting children be, is one I re-visit over and over, but it is ok, I am learning!